My dogs are part of my family, and always have been. Ginger, the cocker spaniel we had during my childhood, was the long suffering participant in my efforts at playing school, house, doctor, and every other game that I would have used a younger sibling for (if I had been fortunate enough to have one!) When Jim and I were first married, we practiced our parenting skills with Buffy, the cocker puppy we brought home on our first anniversary. After we lost Buffy, we went almost 15 years without getting another dog. Why, I'll never know. 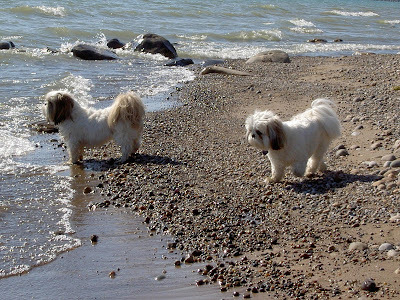 Magic came to me from a friend, who bred her own Shih Tzu in 2002, and offered me "pick of the litter." We fell so in love with this breed, that it didn't take long to decide we wanted another, and so Molly came to live with us in August of 2004. Naturally, I think my dogs are the cutest, smartest, most adorable dogs ever ~ sort of the same way I feel about my kid! But I love all dogs, and if there's one thing I cannot abide in any way, shape, or form, it's cruelty to animals. So, it's love me, love my dogs...or hit the highway!